HYANNIS, Mass. 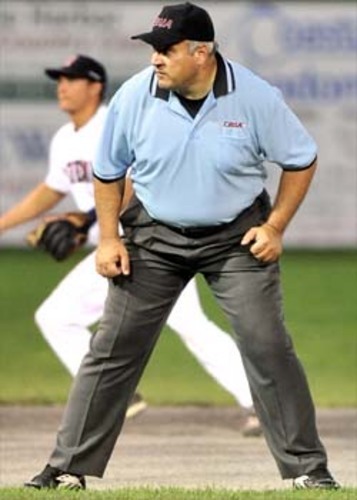 – After working as an official for over three decades, Joe Caraco has been selected as the 2012 Curly Clement Award winner as top umpire in the Cape Cod Baseball League. 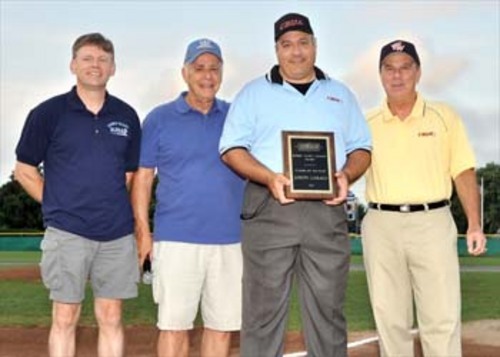 This summer, he reached the pinnacle in his profession by receiving the 9th annual Curly Clement Award, presented for officiating excellence and contributions over the years to umpiring in the Cape Cod Baseball League. Hailing from Malden, Mass., Caraco now resides in Weymouth with wife Karen, daughter Christina, 18, sons Matthew, 11, and Danny, 9. Caraco has worked as an umpire for 30 years, including 20 years in the Cape Cod Baseball League and six years in professional baseball. Previous Clement Award winners include Mark Ottavianelli (2011), Michael Sadowski (2010), John Leeds (2009), Harry Greer (2008), Tim Carey (2007), Peter Hall (2006), Jim McNally (2005) and Walter Bentson (2004). “Joe is an outstanding umpire and belongs in this elite group,” said Yas, who helped present the award to Caraco during pre-game ceremonies Thursday. Robert “Curly” Clement worked as a Cape League umpire for over four decades and was inducted into the CCBL Hall of Fame in 2002. He umpired in 16 NCAA Division I Baseball Regionals, several ECAC Division I Baseball Championships and two NCAA College World Series during his career. Affectionately known as the “Candy Man” for his propensity of passing out candy to players, coaches and field managers during on-field disputes, Clement’s final Cape League appearance was working home plate at the 2000 CCBL All-Star Game. He passed away in 2006 after a long illness.